In late 2008, a midst diffuse hostilities triggered by the revolt in Greece following the assassination of Alexis by police, the Belgian Federal Prosecutor launches an investigation of anarchists and anti-authoritarians. In 2010, on the basis of a list of actions that the police attribute to the “anarchist movement” and while the struggle against the construction of a new detention centre in Steenokkerzeel is underway, magistrate Isabelle Panou is assigned to the investigation, now under the anti-terrorism. In May, then in September 2013, a dozen searches took place within this investigation, the searches targeting different homes as well as the anarchist library Acrata in Brussels. It is on this occasion that the existence of an antiterrorist investigation first emerges. This investigation is led by the anti-terrorist branch of the Federal Judicial Police backed by the State Security and the General Intelligence and Security Agency of the army as well as various anti-terrorist branches of other European countries. Solidarité avec les prisonniers ! Abolition des lois 187, 187A, anticapuche, et sur les prisons de type-C ! Abolition de l’utilisation de l’ADN comme preuve légale ! Liberté pour Savvas Xiros ! 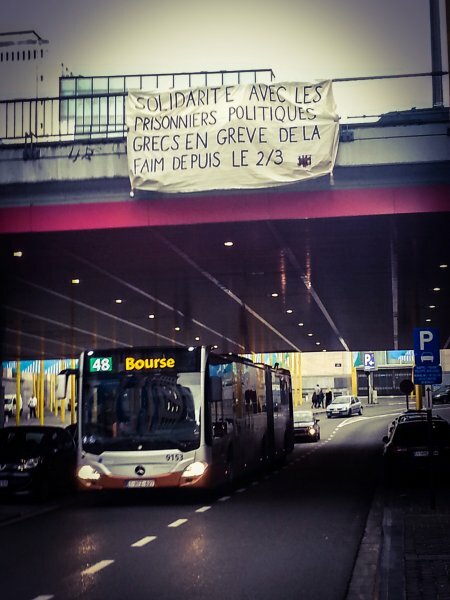 Courage et force à Nikos Maziotis et à tous les prisonniers en grève de la faim ! Bruxelles, Rue du Lombard, 4 avril 2015. An evening event was organized on Monday, March 16 in Brussels by the “Initiative for solidarity with the Greece that resists” with the presence of a Greek politician (not the Syriza MP as announced but Epaminondas Marias, from the rightist party of the “Independent Greeks” – ANEL). Members of Secours Rouge/Red Aid intervened by speaking out, with leaflet distribution and deployment of a support banner for the demands of the Greek political prisoners on hunger strike (abolition of special repression laws, isolation prisons (Type C) and the release of Savvas Xiros, member of 17 November). On Tuesday the 2nd of December 2014, we burned three vehicles belonging to members of the European Parliament. The attack took place near the Général Lartigue Avenue in Brussels. This action is an act of offensive solidarity with anarchist Romanos, currently on hunger strike. 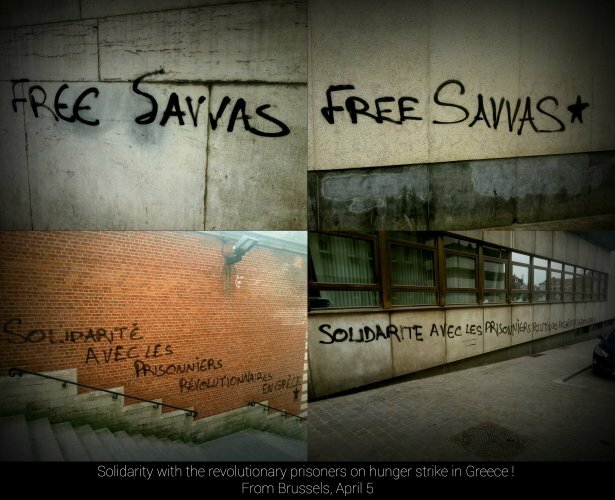 Solidarity with the anarchist and revolutionary prisoners, in Greece and everywhere else. Solidarity with the fights of the comrades in Chile. Report compiled by RabbleLDN, anarchist site based in London, UK. Kurdish groups in Europe and Turkey have stepped up protests in solidarity with their comrades on the frontline in Kurdistan. This text was translated by a comrade to English. It was taken from the journal Salto, subversion & anarchy, issue 2, November 2012 (Brussels). Brussels – May 22, 2013 to 6am, dozens of police officers from the anti-terrorist section of the Federal Judicial Police raided three homes where, among other people, anarchist and anti-authoritarian companions live. The cops also raided the anarchist library Acrata. All those who were present (11) were arrested and taken to the offices of the Federal Police.